Donald Trump is wrapping up his first week in office as the 45th president of the US – and the country is deeply divided. Millions are already calling for his impeachment, as violent protests take place across the nation. The new president is also at war with the media, and the conflict not likely to die down any time soon. Will Trump manage to rally the people’s support throughout his first term? Can the continued backlash force the Electoral College system to be reformed? We ask Ralph Nader, veteran activist, consumer advocate, and former third-party and independent presidential candidate. Sophie Shevardnadze: Ralph Nader, veteran American activist, consumer advocate, six times U.S. presidential candidate - welcome to the show, great pleasure to have you with us. 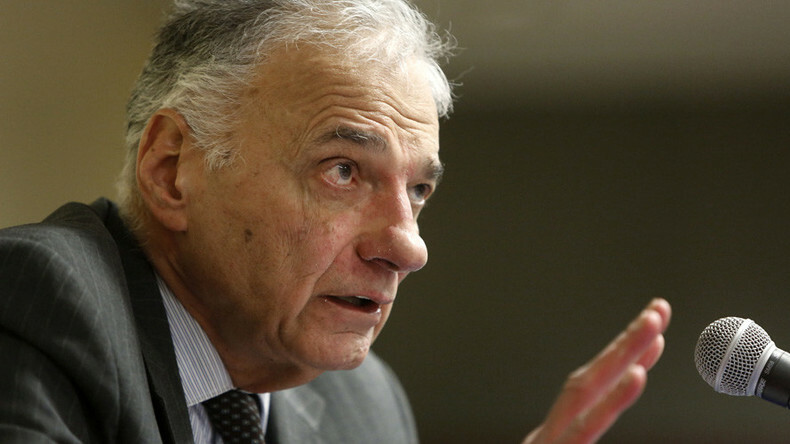 Now, Mr. Nader, we witnessed massive protests across the U.S. as Donald Trump was being sworn into office - a popular slogan protesters used was “Not my president’ - so whose president is Donald Trump then? Ralph Nader: He's the president of the people who voted for him and he's president of the majority of the electoral college - only in this country can you lose the popular vote and still get elected president. SS: Sure, and Trump actually questioned the reason behind the protests, suggesting that demonstrators should have voted instead. But the people as you said, voted - and Trump lost the popular vote. Should the protests be aimed against the system that ignored the results of the popular vote, not Trump’s persona? SS: Why are we seeing this unprecedented protest against Trump even before he had a chance to do anything in office? RN: Because he had unprecedented provocations during the campaign. He went after hispanics, he degraded african-americans, he abused women and bragged about it in prior interviews. He just insulted everybody he could find - as he once said, he had to be outrageous in order to get to the top of the mass media attention. As long as that works for him, he took it to the next month and then to the next month and currently he's taking it into the White House. Judging by his first few days, his personality, easily bruisable ego hasn't changed. He's still hung up on this false statement that millions of illegal immigrants came to the U.S. and voted against him, and that's why Hillary Clinton won the popular vote. No matter how many times even his Republican colleagues, nevermind the major media - said that that's not true, it's a lie. He still keeps saying it, so obviously he has some personal need to be seen as a majority president instead of a minority president - which he is. SS: Do you think he's going to do what he said in his election campaign or do you think he's going to be different once he's in office? RN: So far it looks like he means what he says! In his inaugural address he basically said "I've said this during the campaign, I'm going to mean it!". He had veiled insults of the prior presidents and the condition they left the country in, in trade,for example - who were right on the stand! And then, in the first 2-3 days it looks like he withdrew the TPP, he's pursuing his anti-reproductive rights program overseas, he is supporting fossil fuel drilling, pipelines, he's meeting with the police and the military and highlighting them, and says that he's going to increase the budget, so... you know, you may not like him, and I'm very critical of him, but he means what he says, which is going to keep his polls down, I think, unless he goes after high drug prices and jawbone some of the companies that are going to open up more plants in Mexico or China - that gets some good publicity with the workers and with consumers. SS: What about the 60 million Americans who voted for Trump, you can’t just ignore them, so where do they fit in? RN: Well, you should understand, in the U.S. there's such thing as hereditary voting - that is people vote for the Republican candidate or for the Democratic candidate because his grandparent voted for them. So they start out with 35% of the voters, breaking down into hereditary Republican or hereditary Democrat votes - which is one reason why former NYC mayor Mike Bloomberg didn't run. So, it was a conventional Republican vote, 53% of white women voted for him - which is a real puzzle, given his slanderous behaviour and words towards women, but I think that most of the Republican voters fell into line after they were appalled by some of his outrageous remarks last year. RN: You have to understand the Electoral College, because he won the EC by 70,000 votes in three states. If those were for Hillary Clinton, he would've lost the election. It is 70,000 votes in places like Wisconsin, Michigan, Pennsylvania. People abroad don't understand this crazy system. It is true, he got a few hundred thousands votes from blue collar workers who nearly all would vote democratic, because they liked his anti-corporate managed trade agreements talk, they like his phrases like: "If you want to sell it in America, you better build it in America with U.S. jobs! ", "America First", "Buy American". And those votes, unfortunately for Hillary Clinton were concentrated in Pennsylvania, Ohio, Michigan and Wisconsin. The very places where factories were emptied out and the U.S. global corporations abandoned America and went to Mexico or China or other countries, where there's a very-very cheap labor. So you have to understand that the system tips one way or another on very narrow numbers of votes, because the total popular vote isn't what wins, it's the way it breaks down in various states and transforms itself into a little over 500 electoral votes. SS: One protest organiser - the Disrupt J20 group - said he wanted to see ‘a rebellion in DC and across the country’ - could it come to that? RN: don't see that. These were very peaceful crowds all over the country, with a few exceptions. I don't see that. Our concern is will it to go back and be active in the Congressional districts when they leave the big marches and rallies in the cities like Washington, New York, or will it just peter out? People can become very apathetic if they think that their initial effort didn't have much impact. SS: So what happens to the left-wing progressive movement now? Bernie Sanders is back to being a senator, where is the movement which he united? RN: It dissipated. All of the millions who voted Bernie Sanders are not organising themselves. He's not organising them very vigorously. He has a group called "Our Revolution"... but it's as extensive, it's not as well-funded. I thought he should've had mass rallies right after election, from Washington to San-Francisco. That would've produced cohesion and brought together the millions of his voters, many of them young, who just basically are going the wrong way, many of them voted for Hillary, because that was the only choice against Trump. The labor unions have been neutralised by Trump very quickly because 30%-40% of them voted for Trump and the leaders don't want to counter that 30%-40% of the rank and file, and he's also dangling all these construction jobs or public works - repairing the schools or hiring to fix bridges, sewage, water - which are good paying jobs and they still stay here. He is about to meet with about ten unions and they are all related to construction. They are not related to textiles or healthcare, they are related to construction. So you can see what he has in mind. SS: Sanders attracted a lot of young progressives to the Democratic party - do they have the potential to reform Democrats? RN: Well only if they start working at the local level, at the precinct level as we call it, and taking over the local democratic party. It isn't that hard, but there's a lot of apathy at that level, they don't show up, Democratic Party Committee members at local towns and villages and cities - I don't see any of that happening. I don't think foreign observers fully recognise the amazing exclusionary, suppressive and restrictive impact of the two-party duopoly - Republican-Democrat party, that cannot tolerate electoral competition. SS: Trump has said he is in a ‘running war with the media’. CNN reported on what would happen in case Trump is assassinated, Buzzfeed set up a four-year timer to the next inauguration, Britain’s Guardian paper has called on journalists to unite and dig dirt on Trump… it’s fine for the media to be critical of the president - but is this Trump-media conflict going to be like nothing we’ve seen before? RN: Well, I have seen it before, it's a lot of acrimony. First of all, the mass media gave him huge coverage in 2015-2016 and he continued to get this coverage by insulting them. One by one, and then they realised that this candidate that they've helped to build up was going after them, and now they're going after him. You can see, they're breaking new grounds. For example, in headlines, in the NYT or Washington Post, they would never use the word "lies" and now they say: "Trump says millions of illegal immigrants came to the U.S. and voted for Hillary", and then the sub-headline is "He repeats these lies." - so, you see, they're really going after them and they're going to investigate the conflicts of interest and the all the billionaires and their economic investments and how it contradicts their duty to uphold as they were trusted into public offices he has awarded them. So, there's going to be constant turmoil. I think the press chief, Mr. Spicer realised that he has to tone down some of this, but, of course, Mr. Trump has his own email and he hasn't given it up. He has at least 20 mn people who receive it - so it's going to be a very tumultuous time. What we don't know is the scandals that are going to come out. His top government officials have been confirmed before the full disclosures of their inter-relations with business interests around the country and in the world have been given to the Congress and a lot of that will start coming out, so I think that they're going to him, he's going to go after them and maybe he'll start subscribing to Pravda - who knows! SS: From observations, we see that the mainstream, liberal American press has already become an enemy of Trump, before he even did anything as president. The same thing happened to Obama, when pro-Republican outlets started attacking him on day one of his term. Is there no space in America for balanced media, is this political divide permanent? RN: The Obama case is different. He never really attacked them. With Trump you get daily back-and-forth, like throwing gasoline on fire. So, it's going to be completely different. Now, the Fox network is going to turn around and start supporting him, you can see the signs already. So, no, he says all these outrageous things is just negotiating points with domestic and foreign parties. He's being extreme outrageous, so you can get him at the table and 'cut the deal'. You can that's the beginning adjustment in Fox News. I think some of the mass media will continue being a very-very tough watchdogs, and he'll feed that because he can't resist attacking. He has an easily bruisable ego. I wrote an open letter to him a few days ago, to Donald Trump, and I said: You realize that your adversaries in foreign countries now know about you that they can provoke you into over-reaction in these countries and you'll dig yourself a deep hole if you don't engage in impulse-self control, if you don't control your personality. SS: You have called Trump’s twitter account is ‘a new media’, ‘his public relations arm’ - he’s even got two twitter accounts now - the official presidential one and his own with over 20 mn followers. Now you think he needs to stop this constant tweeting - why do you think it's harmful? RN: Yes, I think his family is trying to get him close his twitter account. His family has non-stop - his children, non-stop his in-laws, non-stop are trying to restrain his outrageous behaviour and he keeps telling them: "Hey, you keep telling me that I should get rid of my outrageous verbalisations and statements - but look how far it has gotten me! It has succeeded, so you're wrong and I'm right." Well, he's now in the president's house and maybe that's a little different from just being a president-elect or campaigning for president. I think it is different, the consequences are more impactful and more devastating. They produce consequences that cannot be predicted. The one thing about Trump's presidency - it's all unpredictable, but you can say it's going to be tumultously unpredictable. It's not going to be unpredictable in terms of normal presidential routine. SS: You’re a symbol of third party politics in America - why isn’t this idea taking off, election after election? Johnson got 3 percent of the total popular vote, Jill Stein won only one. What needs to happen for a third party to break into the political spotlight? RN: Two-party duopoly controls the Presidential Debate Commission, which is a corporation that was created by the Republican-Democrat party in 1987 and that's the only way - unless you're a billionaire and you're running as a third party candidate - it's the only way you can reach tens of millions of people, no matter how often you campaigned, no matter how many big arenas you fill - you don't come to 2% of the people you can reach under presidential campaign. If you're not going to be on the debates... before the debates, the media is not going to cover you, the polls are not going to cover you, it's going to be difficult just to get on the ballot. It's very hard, harder than in many other Western countries just to get your name on the ballot in our country. It's a mockery. Jimmy Carter, former President who monitors elections abroad requires five criteria for these countries in the third world or in the developing world to observe before he flies there and monitors the election, and he said once when he came back that the U.S. doesn't meet any of the five criteria - one of which is a multi-party system. SS: You've predicted a fast impeachment for Donald Trump - so far, the Republicans are backing him, he put together a solid team, his house seems to be all set for the next four years - do you still think he’ll be out of the White House soon? RN: That's unpredictable. He may do a couple of really outrageous things that will cause the Republicans - who dominate the Congress, the House and the Senate - to abandon him. When politicians have their own skin in the game going down, they have very little sentiment for a person in the White House who is sinking them. That was true with Richard Nixon. When I made that statement, it was before the Republicans took over the Congress! I mean, I don't think that many people thought that the Democrats would lose the Senate and not recover a good part of their minority positions in the House, but, again, he's capable of doing anything and if he becomes a liability to his Republican Party and he turns off his base - it could happen. SS: This presidential contest was the choice between two evils for many. What’s behind this crisis of political leadership in the U.S., when people are forced to choose the least hated of candidates? RN: That's right, the Hillary Clinton's polls were, for being dishonest, in the 60%+, and Donald Trump was even a little higher in the high 60s week after week - that's unprecedented in the U.S., and so we had a lot of voters who voted for Trump because they couldn't stand Hillary. Or - who voted for Hillary because they're afraid of Trump. It is not exactly an affirmative mandate for either of those candidates. I think in 2020 there's going to be a three-way or a four-way race. I think there are a lot of billionaires in their 40s and 50s who are looking at Donald Trump and say: "Here'’s a failed gambling tzar, who's a welfare corporate king who said outrageous things and he's President! Why can't we try to be President, because we're more stable, more inofrmed, more enlightened. So, I think, the days of the two-party duopoly, even with all the restrictive laws against third parties that are still in place, may begin to be over. If you have a lot of money, you can overcome ballot access obstacles, you can become well-covered by media just because you've got a lot of money, Ross Perot demonstrated that in 1992, the billionaire from Texas - but you still have the Electoral College, and I think, there should be more coverage of a movement by the states to pass laws that say: "If we reach 270 Electoral College votes, we will throw the Electoral College votes two whoever Presidential canaidate wins the national popular vote" - and already, California, Illinois, Maryland and other states have passed those laws, it's called the interstate compact, the website is nationalpopularvote.com and they are already up to a 165 states having electoral votes, so that's the way you neutralise the electoal college, so that becomes an election based on the national popular vote. SS: It’s not the first time the candidate who lost the popular vote, won the election - and it's all due to the Electoral college system. You have said it time and again that it is outdated - with Trump’s win is it on its way out now? RN: You would think that the Democrats would be even more vigorous to expand the number of states for this interstate compact. Republicans have won two Presidential elections in 2000 and 2016, where Al Gore won the popular vote in 2000, Hillary Clinton won the popular vote by over 2.8 mn votes in 2016, and they lost the Presidency due to some pretty unsavory activities and decisions, from Tallahassee to the Supreme Court's judicial coup-d'etat that selected George W. Bush and blocked the Florida's supreme court full state recount which was in operation. I don't think that's going to happen as readily if this interstate compact starts moving to over 200, 230 electoral votes, and gets more media. It has gotten very little media in the U.S., all these state laws that have been passed. SS: Mr. Nader, we really appreciate your time, thanks a lot for this interview. We've been talking to Ralph Nader, consumer rights advocate, six times U.S. Presidential candidate, legendary activist - discussing what the Donald Trump presidency will bring to America. That's it for this edition of SophieCo, I'll see you next time.